A statue of a suffragette famously trampled to death by the king's horse has been unveiled in her home town. Emily Wilding Davison, from Morpeth, was killed when she stepped into the race track at the Epsom Derby in 1913. Northumberland County Council commissioned the statue which was unveiled in the town's Carlisle Park. It was made by Durham sculpture Ray Lonsdale and its unveiling marks the 100th anniversary of the first women getting the right to vote in the UK. The statue shows Ms Davison while on hunger strike in prison throwing her food on the ground, knowing she would be force fed. Penni Blyth, of Morpeth-based heritage group, Emily Inspires, said: "I'm astounded by it. I saw it in the making and it was a hugely emotional experience. "Emily Wilding Davison's past has changed and inspired our present - hers is a legacy to also inspire the next generation." Ms Davison was knocked unconscious during the fall in front of George V's horse at the derby and died four days later. She was was born in London in 1872, but moved to her family's home in Longhorsley near Morpeth when her father died in 1893. She later joined the women's suffrage movement, signing up for Emmeline Pankhurst's Women's Social and Political Union in 1906. Her intentions at the derby remain unclear, with some historians suggesting she was attempting to draw attention to the Votes for Women campaign by tying a suffragette scarf to the horse's bridle. Plans to attend a dance and go on holiday have been taken as proof she did not intend to kill herself. 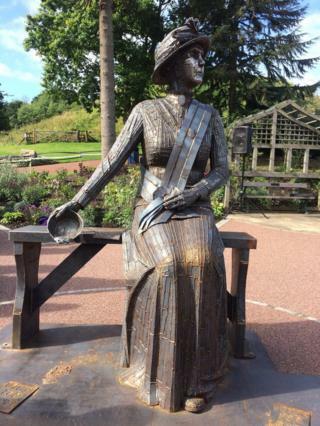 Philippa Bilton, a cousin of Ms Davison, said: "This statue has put Emily and Morpeth on the map. "She had no intention of taking her life - she had a return ticket and stamps on her as she intended to write to her mother. "She was going to a party that afternoon and on holiday the following week."